David Pitcairne, Archdeacon of Brechin, was Lady Lindsay’s brother, and Stowther was the old family place of the Lindsays. David Archdeacon of Brechin. Charter by Mr David Petcarne, Archdeacon of Brehin, to his nephew, James Ramsay, son and heir of the late John Ramsay of Downfield etc 1514-5 Thomas Pitcairn a witness. 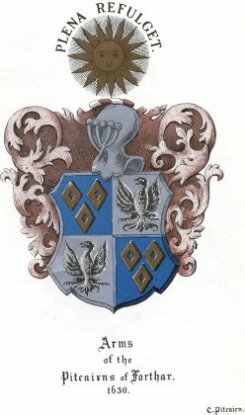 Mr David Pitcarne, Archdeacon of Brechin, was brother to Henry Pitcarne, eleventh laird of that Ilk, and also brother to Lady Lindsay and to Elizabeth Pitcarne, who married John Ramsay. David gave to his nephew James Ramsay, son and heir of the late John Ramsay of Downfield, of the half of the lands of Downfield in the shire of Fife. Dated 2nd Jan. 1515. Thomas Pitcarne was a witness. David Pitcarne is mentioned as witness to many charters at Brechin and elsewhere. Aug.4 1526 at Perth, Mr David Pitcarne, Archdean of Brechin, and John Petcarne, are witnesses to a charter granted to William, Lord Ruthven, and Christian Forbes his spouse, of the lands of Wester Pitlour and Auchnary in Fifeshire. Confirmed by the king 20th Aug. 1526 etc.